For great value passes to explore Japan at a fraction of the normal cost, choose the JR Pass to match your travel plans! Used it for 7 days !! From Tokyo to Uno port in the south of Japan without a hitch!! Remember to buy a Suica or pasmo card to have access to al the subway lines!! That way you’re all set to travel across Japan to your hearts content!!! basically, if you can afford this pass and think you'll get a little bit of use out of it, i think it's worth it. the flexibility of being able to hop on any JR train without planning ahead is super valuable, and the train attendants can always help you figure out which trains are eligible. that being said, the Japanese rail system is complex enough that i wish i had done some more research on the terminology before i showed up. there are lots of express trains that share the same tracks and stations as the local trains, and google maps doesn't do a good job of distinguishing between them. We were traveling from Tokyo to Kyoto, with a stop in Hakone. The JR pass was worth it to us, and was pretty convenient. You sometimes had to deal with lines getting in/out of the gates, but they moved quickly. Also had free reservations, which is great when you are going during a peak season. One trip to Kyoko or Osaka and you pay for it. Delivered right to our home in the states. Our 7-day JR Pass was worth it because we went to Tokyo, Nagoya, Kyoto, Nara, Osaka, and Hiroshima during our trip. The vouchers were sent to our hotel and we exchanged them for our JR passes at a listed exchange office. Everything went smoothly. To use, just show the attendant your pass at JR ticket gates, to go through. 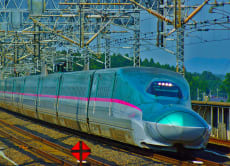 The pass cannot be used on the fastest shinkansens--Nozomi or Mizuho, but that's not a big deal. Some shinkansens need you to reserve a seat. Most shinkansens should have cars/sections for reserved and non-reserved seating. I'd recommend reserving a seat for long distance travel. Just need to go to a ticket office and get one.